Finely milled powder dusts onto the cheeks, providing a long lasting and radiant finish. Sculpt and define your cheeks, or simply achieve a healthy flush with these gorgeous silky smooth Colour Pro Blushers. Micro-fine particles blend with ease for a gorgeous result. Micronisation produces an extremely finely milled pressed powder, which blends effortlessly without patchiness. Ensures for long lasting colour, with minimal creasing or fading. Blush has been used through the decades and placed in different positions on the face for various effects. It is primarily used to add colour and sometimes definition to the face. Blush textures can be matte (Sesame Colour Pro Powder Blush), iridescent (Peach Glow Colour Pro Eye Shadow) or high shine (Sand Shimmer Dust). Different types of product that can be used as blush includes matte pressed shadows, frosted pressed shadows, loose eye dusts and cream blush. The following demonstrates three different blush techniques that can be implemented. Under the cheekbone: Apply colour such as Sesame Colour Pro Powder Blush to the hollows of the cheek using a Small Powder/Blush Brush (the same placement as where shade under the cheekbone is placed). Apples: This technique works best with a smile! Smile and apply colour such as Apples Colour Pro Eye Shadow to the apple of the cheek using brush a Small Powder/Blush Brush. Make sure the edges of the blush are blended well to avoid an obvious circle shape. - Don’t apply colour too far forward, as this can make the face appear as if it is being dragged down. On a very thin face, this can also make the face look hollow. - Don’t apply too high on the cheek bone, as this can cause the face to lose shape and appear flat. The higher part of the cheek bone is where your highlight should be placed. 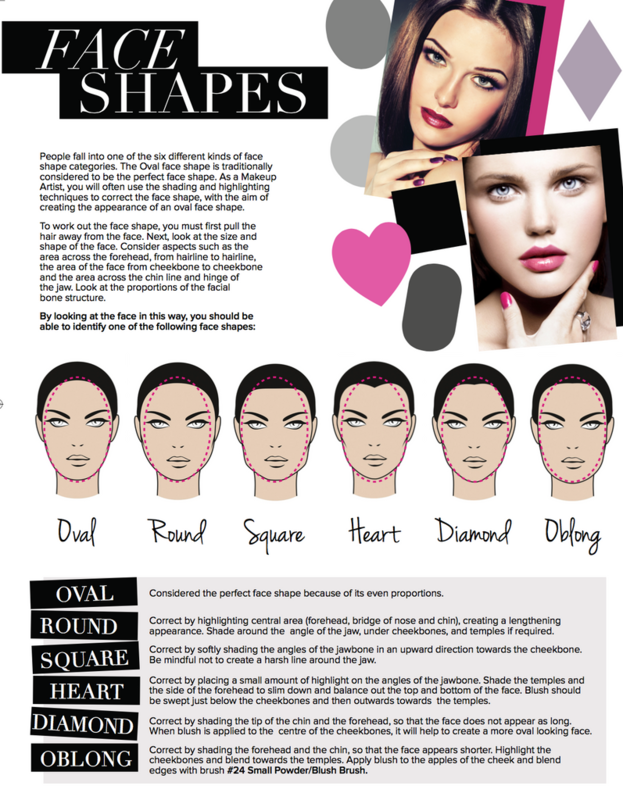 - Don’t apply too low on the cheek bone, as this can change the appearance and dimensions of the face. - Avoid placing too much colour on the face, as this can draw unnecessary attention to the cheeks. Likewise, too little colour has no effect. - Always blend well. Failure to blend will leave a “stripe” on the face. When applying blush, you should aim to create the appearance of soft, blended colour. Using your #24 Small Powder/Blush Brush in a swirling motion can help the blending process.